So I was super excited to find out he had designed a unisex (more affordable) tshirst collection inspired by the hairy apes. If I had a spare £180 (one tshirt will set you back 224 euros) or so, I'd get the one on the right (the Gorilla I believe) and wear it to death. 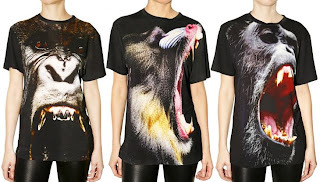 However if you're in the money (feel free to buy me one as an early birthday pressie), these Christopher Kane tshirts are available at luisaviaroma.com in all sizes - the Mandrill, Baboon, Chimp and the Gorilla. Wow, they are great t-shirts. However if you want an even cheaper option there are some similar style t-shirts on ebay. I was looking at ones with wolves instead of a gorilla, with a view to make my own Christopher Kane style dress!